conduit, usually a vein graft or internal thoracic artery, surgically interposed between the aorta and a coronary artery branch to shunt blood beyond an obstruction. a surgical procedure for the treatment of angina pectoris or coronary vessel disease, in which a saphenous vein, mammary artery, or other blood vessel or a synthetic graft is used to build a shunt from the aorta to one of the coronary arteries to bypass a circulatory obstruction. A means of circumvention; a shunt. 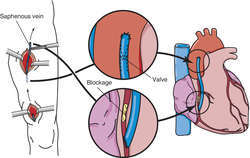 It is used surgically to install an alternative route for the blood to flow past an obstruction if a main or vital artery, e.g., the abdominal aorta or a coronary artery, becomes obstructed. The various procedures are named according to the arteries involved, e.g., coronary artery, aortoiliac, or femoropopliteal bypasses. The circulation of the heart may be bypassed by providing an extracorporeal device to pump blood while a surgical procedure is being done on the coronary arteries or cardiac valves. 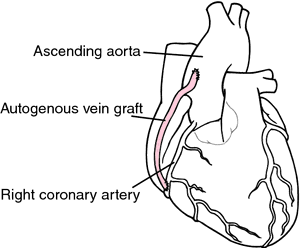 Surgical establishment of a shunt that permits blood to travel from the aorta or internal mammary artery to a branch of the coronary artery at a point past an obstruction. It is used to treat coronary artery disease. Preoperative: The surgical procedure and the equipment and procedures used in the postanesthesia and intensive care units are explained. If possible, a tour of the facilities is arranged for the patient. The nurse assists with insertion of arterial and central lines and initiates cardiac monitoring when the patient enters the operating room. Postoperative: Initially the postoperative patient will be intubated, mechanically ventilated, and will undergo cardiac monitoring. He will also have a nasogastric tube, a chest tube and drainage system, an indwelling urinary catheter, arterial and venous lines, epicardial pacing wires, and, often, a pulmonary artery catheter. Signs of hemodynamic compromise, e.g., severe hypotension, decreased cardiac output, and shock, are monitored; vital signs are obtained and documented according to protocol until the patient's condition stabilizes. Disturbances in heart rate or rhythm are monitored; any abnormalities are documented and reported. Preparations are made to initiate or assist with epicardial pacing, cardioversion, or defibrillation as necessary. Pulmonary artery, central venous, and left atrial pressures are monitored, and arterial pressure is maintained within prescribed guidelines (usually between 110 and 70 mm Hg). Peripheral pulses, capillary refill time, and skin temperature and color are assessed frequently; the chest is auscultated for changes in heart sounds or pulmonary congestion. Any abnormalities are documented and reported to the surgeon. Tissue oxygenation is monitored by assessing breath sounds, chest excursion, symmetry of chest expansion, pulse oximeter, and arterial blood gas (ABG) values. Ventilator settings are adjusted as needed. Fluid intake and output and electrolyte levels are assessed for imbalances. Chest tube drainage is maintained at the prescribed negative pressure (usually -10 to -40 cm H2O); chest tubes are inspected for patency. The patient is assessed for hemorrhage, excessive drainage (> 200 ml/hr), and sudden decrease or cessation of drainage. Prescribed analgesics and other medications are administered. Throughout recovery the patient is evaluated for changes in oxygenation, ventilation, neurological status, and urinary output. After the patient is weaned from the ventilator and extubated, chest physiotherapy and incentive spirometry are used, and the patient is encouraged to breathe deeply and to cough to prevent atelectasis of the lung and to clear mucus from the airway. The patient is helped to change position frequently. Help is also given with range-of-motion exercises and with active leg movement and gluteal and quadriceps setting exercises. Surgical revascularization for peripheral vascular disease of the limbs, using a prosthetic graft (e.g., axillofemorally or femorofemorally) to divert blood to a site distal to an arterial obstruction. Postoperatively, it is important to monitor the patient's vital signs for changes, esp. of pulse and rhythm, and to assess the patient for symptoms of angina pectoris or arrhythmias. Cardiac monitoring and frequent ECGs are routine aspects of care. The surgical wound is checked for bleeding or hematoma formation, or signs of infection or dehiscence. Peripheral pulses are palpated using a doppler, if necessary, to determine peripheral perfusion. Any surgical procedure in which the stomach, or most of the stomach, is isolated and disconnected from the rest of the upper gastrointestinal tract. A surgical procedure for decreasing absorption of nutrients from the small intestine by anastomosing the proximal jejunum to the distal ileum. Although it can be used to treat obesity, jejunoileal bypass has been replaced by gastric bypass procedures because of the significant complications of jejunoileal bypass surgery. The placement of a coronary artery graft without stopping the heart or using a cardiopulmonary bypass (heart-lung machine). A thoracotomy rather than a medial sternotomy is used to access the heart, which is then stabilized by use of a compression or suction device to decrease movement. The procedure is used primarily for grafting a single vessel, usually the left or right internal mammary artery. Although MIDCAB has the advantages of lower surgical costs and possibly a decreased risk of complications, it has the disadvantages of limited surgical visibility and more difficult suturing. A bariatric surgical procedure in which the superior portion of the stomach is isolated from the rest of the stomach and the jejunum is connected to it. As a result, food passes directly from the proximal stomach into the middle of the small intestine. It bypasses the majority of the stomach, which is isolated from the working portion of the stomach and from the duodenum. An opening is made in the duodenum and the jejunum, and the two organs are connected via a surgical stoma. This permits drainage into the jejunum of gastric secretions from the isolated greater curvature of the stomach. This form of gastric bypass is the most common bariatric surgical procedure and among the most successful. Since the duodenum absorbs many important vitamins and nutrients, including iron, vitamin B12, and calcium, nutritional deficiencies and iron-deficiency anemia are common complications. Others include nausea, vomiting, ulcers, and anastomotic leaks. Employment following aortocoronary bypass surgery in young patients. 13 Aortocoronary bypass of three coronary arteries. Patients with aortocoronary bypass grafts such as internal mammary artery have a seperate risk factor probably because of the direct contrast injection to the vertebral artery during the catheterisation of the internal mammary artery ostium.